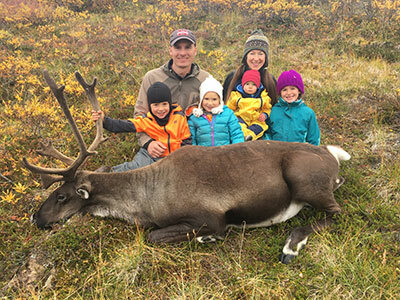 Alaskan Liz Luber harvested a caribou in 2018 and shared the photo with Fish and Game. While the image features the caribou, it highlights the fact that this was a family hunt. Every year, hunters and anglers contribute photos to Fish and Game. The Division of Wildlife Conservation prints photos in the hunting regulations, and others are used on our website and in educational brochures and outreach materials. Pictures that convey the hunting experience are particularly welcome: hiking, boating, camping, field dressing, and packing out game. Photos can be emailed as jpegs with information about the hunting trip and a sentence granting Fish and Game permission to use the photo. A permission form with details is available with the contact information at the end of the article. Proud parents donate most of the photos we receive, and that’s understandable. It’s great to see young hunters in the field, and in recent years, a third or more of these young hunters are girls. But we want to represent the range of ages of hunters and outdoor enthusiasts, and we don’t want to give the impression we only want photos of young hunters. 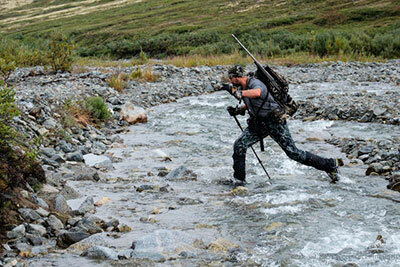 Gabe Bleau crosses Carpenter Creek on a sheep hunt. Photograph courtesy Ben Reynolds. The aesthetic of hunting and fishing photography has changed in recent years. You still see pictures of an angler thrusting the fish broadside at the camera, but more and more, in magazines and websites you see pictures of anglers kneeling in the shallows, releasing the fish, or friends and family together. The landscape and surroundings are featured more often, giving context. Hunting pictures have changed as well. It’s rare to see blood in a “trophy” photo these days, and animals are posed against scenic backgrounds showing the landscape of the hunting area. Nathaniel Grimes shared this picture from a winter caribou hunt in the White Mountains. Suggestions include: conceal wounds, and put the animal’s tongue in if it is sticking out; don’t pose kneeling, stepping or sitting on the animal; avoid laying a bow or firearm on the animal; take photos of cooking the meat and other beneficial uses of the animal; and set up your photo to convey a story about the hunt, not the result. Fish and Game uses trapping photos in the trapping regulations booklet, and photos donated by trappers are appreciated. 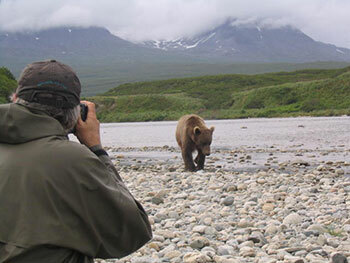 Photos of wildlife and wildlife viewing are also welcome and useful. Anne Sutton took this photo at McNeil River State Game Sanctuary. The Division of Sport Fish also uses and archives fishing-related photos contributed by the public. The covers of the annual fishing regulations feature a picture of a young person fishing, an image that represents what fishing means to young people and their families. Those photos must be received by Sept. 30 for publication the following year. ADF&G publishes four different regulation booklets, specific to different areas of the state, and each has a different cover. More information on submitting fishing photos is available online.